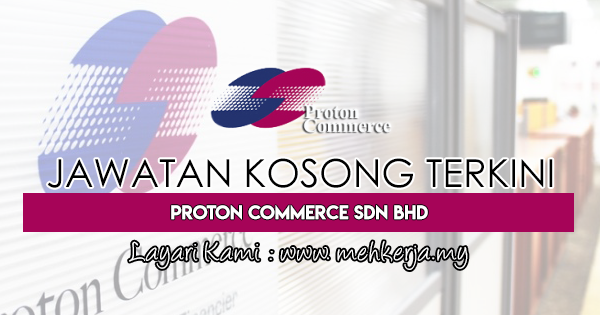 Proton Commerce Sdn Bhd (PCSB) was incorporated on 27th October 2003 and started its operation on 1st March 2004. PCSB is a 50:50 joint venture company between Proton Edar Sdn Bhd (PESB) and CIMB Bank Berhad (CIMB). PCSB offers competitive hire purchase loan financing packages to new Proton car purchasers through PESB and EON sales network nationwide. With the combined infrastructure of the two entities, PCSB can offer better deals for Proton car financing with one-stop online convenience together with fast application and approval processes. 0 Response to "Jawatan Kosong Terkini di Proton Commerce Sdn Bhd - 13 Sept 2018"